The i.MX RT1064 is the latest addition to the industry’s first crossover processor series and expands the i.MX RT series to three scalable families. The i.MX RT1064 doubles the On-Chip SRAM to 1MB while keeping pin-to-pin compatibility with i.MX RT1050. This new series introduces additional features ideal for real-time applications such as High-Speed GPIO, CAN-FD, and synchronous parallel NAND/NOR/PSRAM controller. The i.MX RT1064 runs on the Arm® Cortex-M7® core at 600 MHz. 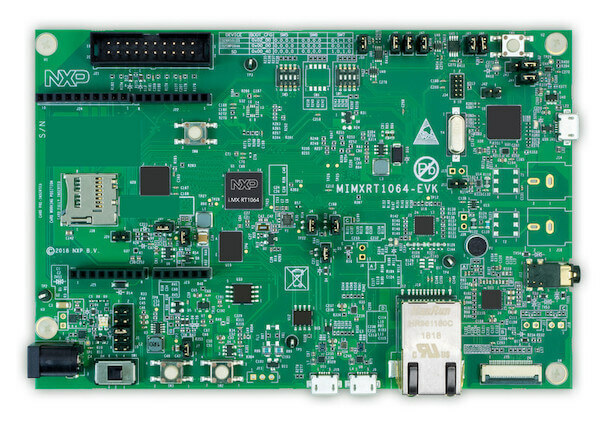 The MIMXRT1064 SoC has four pairs of pinmux/gpio controllers. The MIMXRT1064 SoC is configured to use the 24 MHz external oscillator on the board with the on-chip PLL to generate a 600 MHz core clock. The MIMXRT1064 SoC has eight UARTs. One is configured for the console and the remaining are not used. Attach a J-Link 20-pin connector to J21. Check that jumpers J47 and J48 are off (they are on by default when boards ship from the factory) to ensure SWD signals are disconnected from the OpenSDA microcontroller. Regardless of your choice in debug probe, we will use the OpenSDA microcontroller as a usb-to-serial adapter for the serial console. Check that jumpers J45 and J46 are on (they are on by default when boards ship from the factory) to connect UART signals to the OpenSDA microcontroller. Connect a USB cable from your PC to J41.